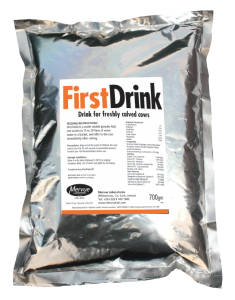 By providing First Drink after calving the cow recovers quickly from calving and is given a very good start to lactation and subsequent fertility. First Drink is a water soluble powder. Mix 1 sachet to 15 to 20 litres of warm water. To achieve an optimal drinking temperature. *Ensure the cow cannot drink water after calving, until First Drink is supplied. Note: A high level of Nicotinic acid is added to support ketosis prevention. Increasing the rate of metabolism of ketones and reducing fat metabolism in early lactation.